Viaduct Supporters Continue Push for Public Hearing — Why Save the Viaduct? To Keep Kids Safe. The Feb. 21 City Council meeting was packed with residents calling for the first PUBLIC HEARING about the McBride Viaduct. As a candidate in 2017, Mayor Schember said he would "not object" to a public hearing, and, City Council also agreed to hold a Public Hearing. But, both Schember, and some members of Council reversed their position in 2018. 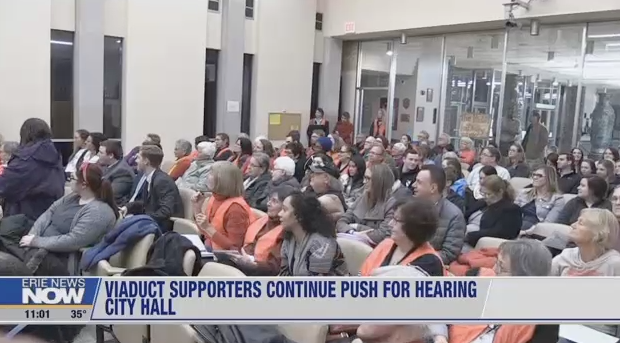 Erie News Now's Andrew Hyman reports: Wednesday night, supporters of the McBride Viaduct continued their push for a public hearing. And they're accusing Mayor Schember of receiving bad information. The decision was made by city council on Feb 7. to demolish the structure. Despite the decision, members of Erie Connect + Respect are still not backing down. And are continuing to push for a public hearing. Both the organization, and the mayor, made themselves heard yet again Wednesday evening. Supporters of the viaduct continue to stress the city, and the mayor are misguided in their decision to tear it down. With many arguing that the mayor has received false information regarding the cost of repairs and maintenance versus the outright demolition. Erie CPR President Adam Trott argued that engineering reports given to his organization are "alarmist" in nature, and do not accurately reflect the current state of the structure. Trott says a public hearing is still badly needed as he feels the city has not adequately listened to the organization’s arguments. Mayor Schember was given time to reaffirm his views on the demolition, stating that while he respects the passion of supporters, the decision is final, and he believes the city has heard all they needed to hear, as they look forward to beyond this project. "His meetings with us, he never listens, he was attending, he was present, but that's so different from listening. “ Trott said “He didn't and he comes out, and he says things that are so wrong, that we debunked over and over again." "I respect people that disagree with me, and I’ve talked with many of the members of CPR for instance, and we've said we'll work together on other things. “ Schember said “But, at least, one-on -one, we're respect the fact we got a different position on this, we're not going to agree on it. There's other important things we need to work on, and that's the most important thing to me. And we gotta have a mutual respect, we've gotta listen to each other, and we gotta move forward." Trott tells Erie News Now that in spite of city's decision, he and Erie CPR remain hopeful that they will earn the opportunity to have a public hearing. Older PostOnly $1.35M is needed to stabilize the Viaduct!